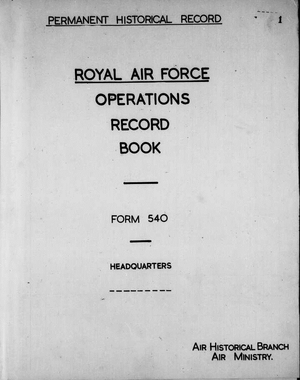 -- The Operations Record Book was an official record of the activities of a squadron during WWII. Each entry (usually daily) was a brief summary of the operations carried out by the Squadron for that day (or night). Most often a junior officer was charged with writing this account however all ranks sometimes had a part in writing this important record. The information entered in an ORB was often a bare summary of the operations carried out by each crew after they returned from a mission. Any notes related to the mission, such as any problems encountered, equipment failures, etc. This is an ongoing project: 418 Squadron was involved in many campaigns.